Well said, and how fine to find someone standing up so articulately for one of the grand overlooked masterpieces of the literature of ideas and the history of science. Thanks. 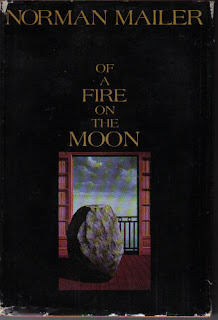 I've read OAFOTM twice,and it crackled with Mailer's energy and insight both times. It had been criticized as lacking the immediacy of his previous books because he couldn't be part of the narrative, but I think he worked this to his advantage; he was compelled to observe more, to report more, and to philosophically confront the notion that an artist's imagination cannot accomplish the same astounding things applied technology and engineering can. Mailer, an engineer by training and a novelist by instinct, was the perfect witness to mull these things over with some of the best prose he ever wrote.